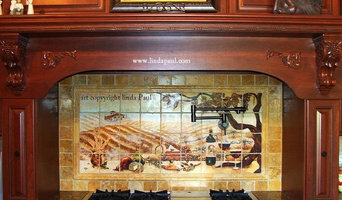 Linda Paul is a painter, sculptor and tile designer. Her paintings , canvas art prints and tile backsplash murals grace homes around the world. Her work includes contemporary and classic designs. The kitchen backsplash collection includes painted tile murals and stone and metal backsplash medallions. Your Premier Source For Custom Tile and Stone Products Relief Carved Stone Panels and Stone Moldings Etched Tile, Etched Stone and Etched Slate Products, Decorative Sandblasting, Laser Engraving, Laser Marking and Cutting CNC Routing Manufacturing: Relief Carved Stone Panels and Stone Moldings Graphically Enhanced Etched Tile, Stone and Slate Decorative Tile, Custom Kitchen Tile and Back Splash Tile, Tile Murals, Decorative Wall Tiles, Decorative Floor Tile, Custom Fireplace Surround Tile Accent Tile, Listellos Custom Subway Tile Stone Tile Borders Hand Made Tile Art Tile Creating: Custom Awards, Custom Plaques, Custom Promotional Items Custom Address Signs and Plaques, Personalized Gifts Garden Signs and Plaques, Recognition Tile Donor Wall Tile, Donor Paver Tiles Fund Raising Bricks and Pavers Engraved Promotional Products Personalized Garden Markers Pet Memorial Markers Tile and Stone Signs Unique Gifts Enabling: You to realize your bathroom tile ideas, kitchen tile ideas, back splash ideas, fireplace surround ideas and fireplace design ideas, Fund raising ideas, Personalized gift ideas and custom etched tile and stone ideas. Materials Graphically Enhanced: Slate * Porcelain * Granite * Travertine * Ceramic * Marble Limestone * Glass * Crystal * Wood * Metal * Acrylic Cork * Leather * Fabric * Fleece Processes: Decorative Sandblasting, Sand Carving Abrasive Etching, Marking and Cutting Laser Etching, Marking and Cutting Light Machining and Fabrication of Stone, Wood, Metal and plastics. Creative Custom Interiors was founded in 1999 and works with homeowners and/or Interior Designers on both commercial and residential projects. 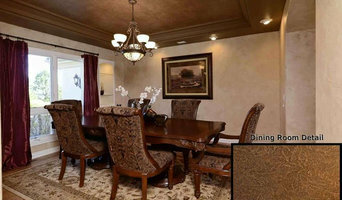 We make your walls and ceilings beautiful with a large variety of decorative and faux painting treatments such as Custom Textures (hand troweled and fossilizing), Color washing, Glazing, Handmade Papers, Specialty Plasters, Marbling, Iridescent Ceilings, Tissue Paper and Layered Metallics. Creative Custom Interiors also specializes in helping homeowners get an updated custom look for their kitchen and bathroom cabinets. They use a paint and glaze process that highlights the details of their cabinets and makes them beautiful. CCI was started by Heather Marks and John Kidd who are institute-trained artists. The company's goal is not to meet the clients expectations but to actually exceed them. Because John and Heather came from “Corporate America”, they operate their business by combining creativity with common business practices (such as honoring appointments and time schedules). Based in Castle Rock, Colorado (south of Metro Denver), CCI operates primarily in Douglas county but also services southern Denver, Colorado Springs and the mountain communities. High demand for their unique and creative talents has also taken them to areas throughout the United States. I am a painter of Bold Modern Art using both oil & acrylic mediums - my studio located in Boulder, Colorado. I specialize in large and small oil and acrylic paintings, working directly with clients, interior designers, and galleries. I love animals so I also do "sensitive pet portraits" for clients on commission as part of my business. The galleries that I am partnered with include: Creative Framing Gallery, Louisville, Co. / Osmosis Gallery in Niwot, Co / The Fine Art & Frame Gallery, Ft. Collins, Co / Faustina's Gallery in Lewisburg, Pa.
Large scale portrait and mural artist. Nationally recognized & award winning. Magpie Painting, with over 15 years of high end interior decorative painting, friendly and very reliable. Custom Fine Furniture. Custom Vanities. Small Batch Production. Modern. Handcrafted. Distinctive. Since 2005. Invest TODAY in something extraordinary. Contact us for a FREE consultation. 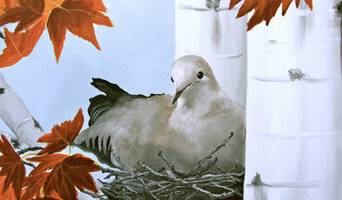 I create fine art paintings for rentals and purchases. 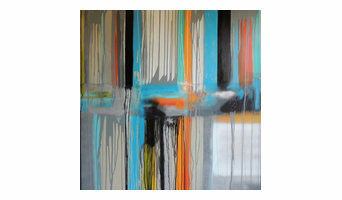 Contemporary and Abstract paintings in acrylic and mixed media featured in tv/film productions, and in many private and staged homes. Paintings have been showcased on the TV shows CSI: Crime Scene Investigation, CSI: Miami, 90210, How I Met Your Mother, and more. I am an artist and a builder. I have been in the stained glass business for 23 years. I offer a full range of stained glass window services to Englewood, Denver, Castle Rock, and Aurora,CO. I was taught by Frank Loyd Wright's great-grand daughter. I worked for several glass studios around Denver and decided to go on my own in 1985. I also work as a professional glazier in the industry glass business. I have done work for private residences, corporate business, churches, restaurants, casinos, antique collectors, government buildings and libraries. There is great satisfaction and enjoyment to be derived from actually making windows you’ve designed. I am fascinated with the many possibilities that glass has to offer, and different techniques that can be used in combination with each other. I hope that people who experience my work will have there sensibilities heightened. The beauty of glass the colors, the transparency and silkiness of the materials is a miracle to me. The qualities of the glass are mysterious and have a richness that is only next to nature to duplicate. It’s about listening to my clients and finding ways to get the outcome that is desired. I like to incorporate all forms of nature in my designs. However the design may change with ideas that were not on the first sketch. The light must always be taken in consideration in design and construction. Manipulating light has always been my primary interest. I look for ways of working on glass that I have not seen before. If you are looking to transform your home into a work of art, give me a call at (720) 903-2670 or click the "Contact Me" button to send me a message. I look forward to working with you! Brock Madison has been artfully hand-crafting unique functional art glass such as bathroom glass sinks, for clients since 2003. Each and every one of my art glass items, receives the utmost in individual attention. Nothing is mass produced, in-fact most items such as the sinks, are made to order and feature one-of-kind uniqueness. Glass, an ancient unforgiving medium with rare endless creative opportunities. Come take a look! Scottish Stained Glass is the largest stained glass studio of our kind in the United States. Having completed more than 40,000 windows for more than 13,000 clients in the past 21 years we are the nation's leading provider of custom leaded glass. Your source for authentic street banners from art museums. 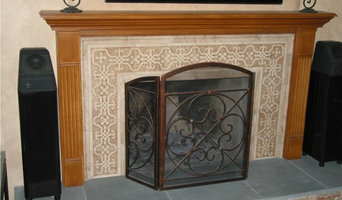 With BetterWall, you get a unique, dramatic work of art to display in your home. All of BetterWall's beautiful banners are the real McCoy! They have been displayed on streetlamp posts and museum facades in cities across the country. Made of vinyl or heavy-weight canvas, the banners are well-equipped to withstand outdoor display. All banners are in excellent condition with no rips, tears, fading or large blemishes. Minor surface blemishes or other slight signs of wear do not detract from the beauty of the images and add to the banners' value and authentic charm. Some banners have wind-slits, small half-moon shaped cuts that allow the banners to withstand high wind without ripping. All banners are carefully cleaned and stored in keeping with appropriate archival protocol. Each banner comes with a certificate of authenticity. Remember, when you purchase a banner through BetterWall, a percentage of the proceeds goes back to the museum. Do your part to advance good design, support the arts, and make a statement that makes a difference! Glass artist specializing in custom made lamps, art glass panels, vessel sinks, garden art, table tops, coordinated tableware and wall art. Helen focuses on kiln fused glass. The glass designs are constructed piece by piece, and then melted in a kiln to 1460F and above where it becomes liquid. After cooling and annealing a solid piece of glass has been made. The glass is often fired a second or third time to create 3d shapes. Sometimes the glass is layered like a cheese sandwich and melted together other times thin strips of glass are placed on edge like dominoes and fired together. Both techniques enable her to create strong bold designs and distinctive color placement. The designs are created to take the best advantage that light can bring to a piece. Often a pattern will change as you view it from different angles depending upon where the light comes through.